SCVHistory.com | Roads | El Camino Real: It Wasn't What You Might Think. El Camino Real: It Wasn't What You Might Think. El Camino Real traces its history all the way back to 1906 with the placement of the first bell. Caltrans photo. Click to enlarge. There was no single "El Camino Real" linking the missions of Alta California, just as the missions were not a day's ride apart. Some were less than one, others more than two — and that's only when the last mission opened, 54 years after the first, because they weren't built in geographic order. During the Spanish period, all roads were royal roads (caminos real) inasmuch as they belonged to the king. During the Mexican period there were no royal roads, as the monarchy had been replaced with a civil government. The singular "El Camino Real" known across California today was a fabrication of the tourist period (circa 1890-1920s) when boosters, fueled by the expanding railroads and the fledgling Automobile Club, sought to entice travelers and their dollars by romanticizing the mission period with fairy tales of fluffy friars handing out bon-bons to starving Indians. But a century earlier, when the Indians were conscripted into mission service by Spanish soldiers and clerics, the roads weren't fixed, and commerce between the missions was primarily facilitated with ships running along the coast. "There might have been some kind of more or less continuous footpath, but it was not a regularly traveled thoroughfare," said Auto Club historian Matthew Roth in a 2013 interview*. "El Camino Real was a product of the same impulse that gave us the Spanish Colonial Revival in architecture — imparting an exotic hue to the region as a way to attract more tourists and settlers." Spearheaded by Annie Picher of Pasadena with support from the Landmarks Club (which restored the crumbling missions), as well as the Native Daughters of the Golden West (not to be confused with Native American daughters), and others, the El Camino Real Association formed in 1904 to lobby for government support to "recreate" the road. 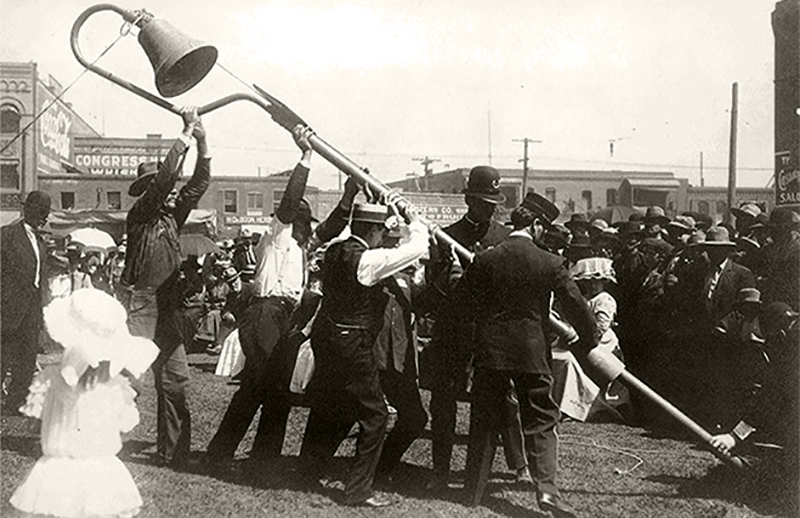 Landmarks Club member Reginaldo del Valle came up with the idea of placing identical bells along the roadway, and from 1906 to 1914, the El Camino Real Association installed more than 400 markers along the route that would become one of the state's first paved highways — if not exactly its oldest. The road leading north out of the San Fernando Mission over the Newhall Pass via Beale's Cut to Saugus and on to Ventura and Santa Barbara was marked in 1906. * KCET: "How El Camino Real, California's 'Royal Road,' Was Invented" by Nathan Masters, January 4, 2013. Los Angeles Sunday Times | March 11, 1900. 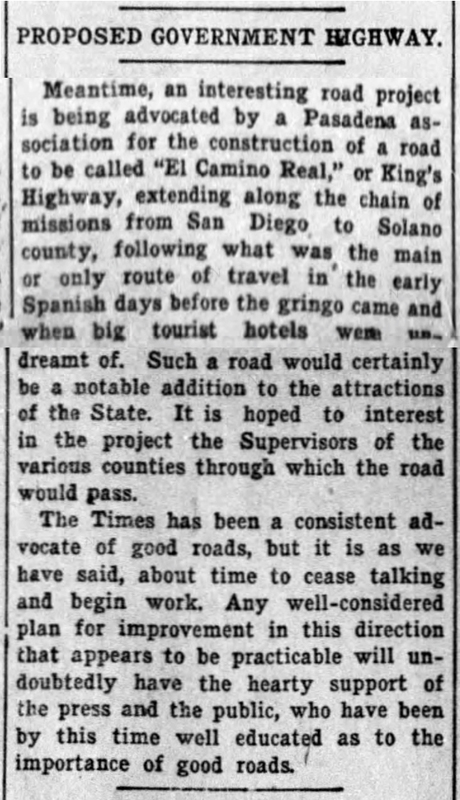 [...] Meantime, an interesting road project is being advocated by a Pasadena association for the construction of a road to be called "El Camino Real," or King's Highway, extending along the chain of missions from San Diego to Solano county, following what was the main or only route of travel in the early Spanish days before the gringo came and when big tourist hotels warn undreamt of. Such a road would certainly be a notable addition to the attractions of the State. It is hoped to interest in the project the Supervisors of the various counties through which the road would pass. The Times has been a consistent advocate of good roads, but it is as we have said, about time to cease talking and begin work. Any well-considered plan for improvement in this direction that appears to be practicable will undoubtedly have the hearty support of the press and the public, who have been by this time well educated as to the importance of good roads. San Francisco Chronicle | November 12, 1903. El Camino Real, which, being interpreted, is the king's highway, is a name which at some period or other got itself attached to the devious series of trails over which the Spanish soldiers and missionaries usually passed when they journeyed between Los Angeles and San Francisco. Just now a company of amiable people are urging the construction of a great "modern road" along that alleged line, not because good roads are more needed there than anywhere else, but because priests and soldiers occasionally traveled there some eighty or 100 years ago. That is sentiment run mad, but the suggestion seems to have been greedily seized upon by the "Landmarks Club," whose first duty, we suspect, will be to locate the exact route of the alleged trail, so that, like other "restorations," it shall be as nearly as possible an exact replica of the original. Without pretending to any information in regard to the matter, our knowledge of the vagaries and conflicts of tradition justifies the prediction that if it is to definitely and authoritatively locate this route the Landmarks Club has on hand the biggest job yet undertaken. There is no objection, however, but on the contrary, there should be the greatest encouragement to those concerned in the movement, to their building the proposed road if they have the money, or if they can get it from the communities living along the line who feel that they would like to drive their teams along a public automobile race track. If, however, they propose to get the funds from the State treasury at the expense of other people who need good roads of their own which they cannot get the money for, there is a very decided objection to the entire proceeding. Good country roads are matters of exclusively local concern. The communities which are enterprising enough to build them will surely have their reward. Those which will not build them should go without them. Since the advent of railroads there is no State reason for the construction of through country roads. The people can get about and can ship their goods. If sentiment and love of the old is to move us — and there are many worse impulses — we commend to our enthusiasts the reconstruction of a genuine Spanish "road," impassable except on horseback or on foot, with a revival of the mustang, the lariat and the Mexican saddle. That would be a real "restoration." But a California "camino real" on a perfect grade, and crowded with devil wagons speeding at fifty miles an hour, is no appropriate project for a "landmarks club" to take hold of. Our Spanish forbears had nothing of the sort.